React-Shun alters the chemistry of your investment during burnout, creating an inert contact layer in the mold cavity. React-Shun will greatly reduce rough casting surfaces caused by the reactive chemistry of prototyping resins and gypsum bonded investment during burnout. You only need to dip your resin parts into the React-Shun solution 3 - 5 times to achieve fantastic results. You should blow off the excess with a light stream of compressed air between dips especially in the detail areas. Close your bottle as soon as you are finished dipping as this material dries very quickly. During the burnout process, React-Shun creates a thin protective inert layer inside the mold cavity which produces a smoother surface on your casting. React-Shun forms this inert barrier while maintaining the details of your design. React-Shun's chemistry plays an important role in achieving good results when casting all directly castable resins. Proto Product’s ProtoCast material and Asiga’s SuperCAST v3 are two of the best resins for direct casting in gypsum bonded investment. Asiga’s SuperWAX v2 is great for direct platinum casting. 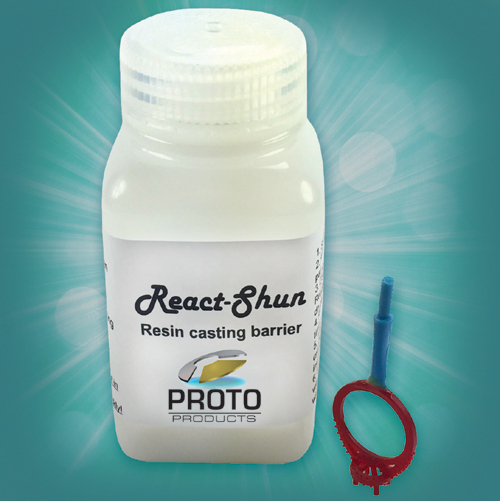 React-Shun is also used to create direct production molds from Resin models. React-Shun allows you to make vulcanized production rubber molds of resin models using low temperature silicone rubber such as Castaldo VLT, Zero D Products LSLT-160, and Nicem low temp rubbers. Grow your feed sprue along with your RP part or use a heat tolerant Super Glue to attach a metal or RP feed sprue after. Give your React-Shun a little shake, open the top, and dip your part only once or twice at the most for molding. Dipping your RP model into React-Shun creates an all over even coating that prevents the rubber from bonding to the RP part. Sprays and other methods simply cannot achieve the same results as the React-Shun dip. When making a mold of an RP part, it is important to pack the rubber carefully, close, and evenly around your part. You do not want lumps in your mold. You will want to make sure that the pressure of the vulcanizer platen is evenly distributed as the pressure is applied gradually over a period of about 7 to 10 minutes. Applying too much pressure too quickly can cause distortion of your RP model that will result in distorted waxes. Asiga’s PlasPINK, PlasGRAY, FusionRed, and FusionGray are all good materials for direct molding.